When Holidays come with all the fun and laughter, busyness, friends and family. It is easy to feel left out and not feel the magic of Christmas. 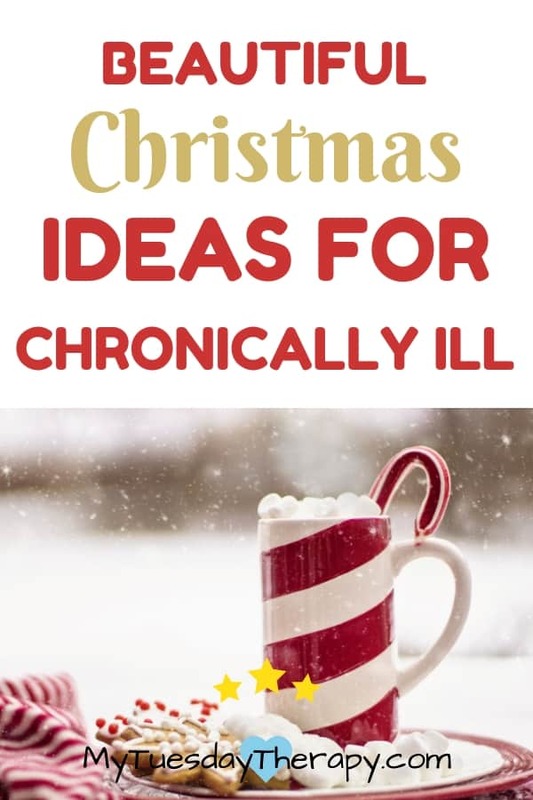 But don’t let your sickness or chronic illness stop you from having a Magical Christmas. This post contains affiliate links. If you choose to purchase through these links, I will get a small commission at no extra cost to you. Chronic illness can keep us from doing and enjoying so many things. But not this Holiday Season! I love Christmas time. Buying and wrapping presents. Decorating the house. Getting together with friends and family. And reading about the birth of our savior, Jesus Christ. There is something special in the air in the weeks and days leading to Christmas. 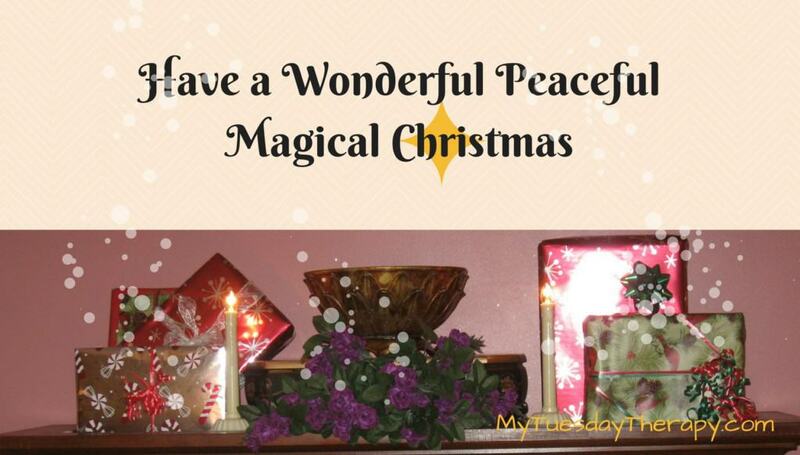 What can you do to make the Christmas wonderful when you have a chronic illness, extreme fatigue etc. 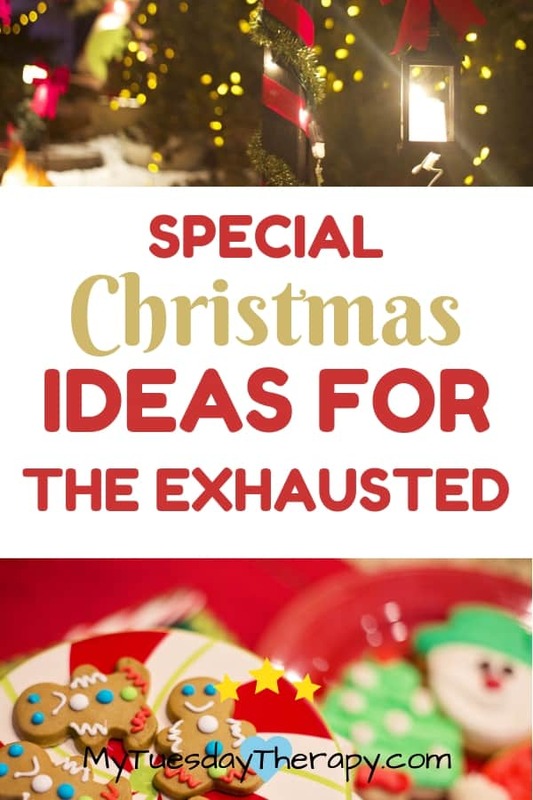 Here are a few ideas for you to consider to make this Christmas a memorable one. If you are struggling with exhaustion or are bedridden, you probably spend a lot of time in your bedroom. Make it Christmasy with these simple suggestions. Lanterns are so cute! I like using real unscented candles but if you are not a fan of candles or if they make you ill, get a lantern with a fake candle. The soft glow of the flame is peaceful. This lantern set is adorable. Place a festive box on your nightstand to hold the Christmas cards you receive so you can easily reread the letters and Christmas wishes. Bring Christmas cheer to your bedroom with Holiday Bedding . So many options to choose from. If you like Santa and the HO HO HO, go ahead and spread the fun comforter on your bed. You could also use colors that go with your Christmas theme whether it is something blue, silver or red. Nothing says Christmas like a fireplace with stockings hanging from it. If you don’t have a fireplace in your bedroom, get an electric one. I have a small cute fireplace. It has been on for a couple of years almost every day and works like a charm. It has a heating function which can be a little too noisy for some. But can also work as a white noise if you want to take a nap and block out some of the sounds from other rooms. Maybe a tiny one for the bedroom right by the fireplace. A Christmas tree always gets me in the Christmas mood. I love to just sit and look at the beautifully decorated tree, the glowing lights while listening to Christmas carols and sipping tea or hot cocoa. 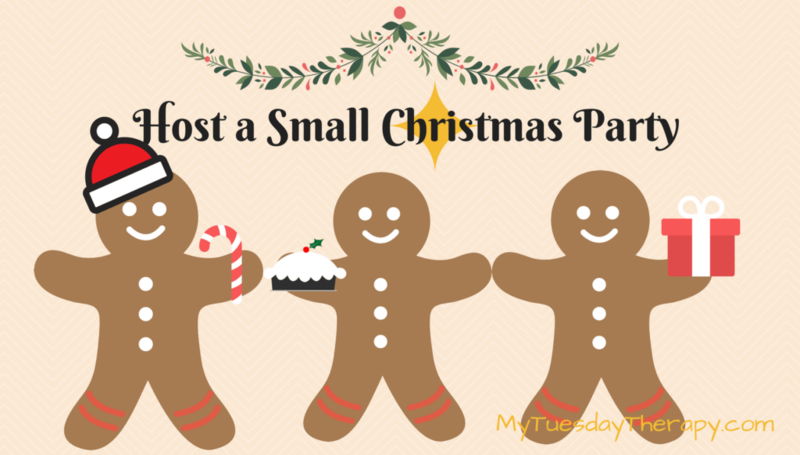 Your Christmas Party does not have to be anything big and complicated. You could simply invite a friend or two to come over. If you are bedridden, a true friend would love to sit next to your bed and enjoy some Christmas treats with you. Treats from the store are perfectly fine. Or accept your friends offer to bring the goodies with her. You could play a game, watch a movie together or just chat and enjoy a cup of tea and some cookies. Being able to participate in a Christmas party will put a smile on your face and joy in your heart. Put together a Christmas activity bag of things to do this Christmas season. If you love clean romance novels, this is the one to get: Forever Christmas. A sweet story set in the town of Jingle Bells. I like the writing style of Christine Lynxwiler and if you enjoy this book, you might also want to get Arkansas Novella Collection. What would we do without the adult coloring books! Get a Christmas coloring book or two :). I looked at a few and loved this one. Very cute pictures! But if cuteness is not all you are looking for, you might also enjoy Go Tell It On the Mountain or Joy to the World coloring books filled with beautiful pictures. Christmas and chocolate go hand in hand for me. If you are able to eat chocolate, put some in your Christmas Bag. Hot cocoa or tea always tastes even better from a beautiful mug. This beautiful magazine contains poetry, essays, recipes, bible verses, and amazing pictures to put you in the Christmas mood. If you like crafts you might want to add a couple in your Christmas Activity Bag. You can find plenty of ideas on pinterest or in craft stores if you are able to go. So many Christmas movies to choose from! You might already have a quite the collection around the house. Keep them nearby and maybe buy a new one to add in your Christmas Activity Bag. 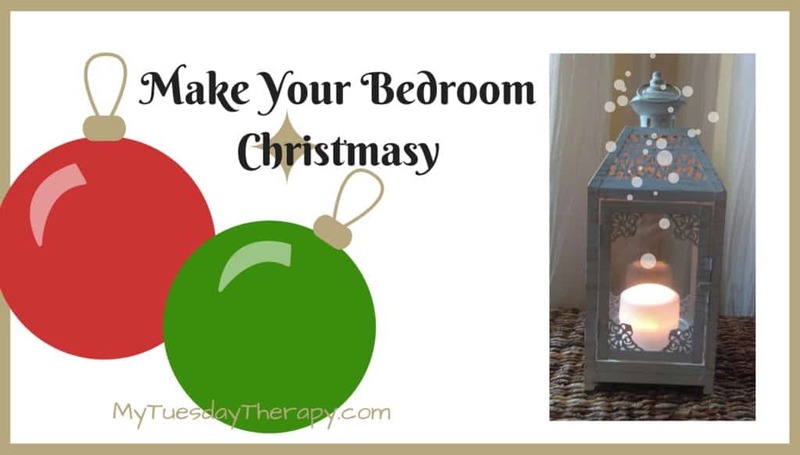 If you are able to tolerate essential oils, have a diffuser in your bedroom to spread the aroma of Christmas. If you don’t have a diffuser, no problem. A great diffuser alternative is a cotton ball. Put a couple of drops of oil in a cotton ball and place it in your room. and a beautiful winter scene of ice skaters. The puzzle storage case is super handy. You can lay it on your bed and work on the puzzle and then close it up to wait for you to work on it again. Nothing like beautiful Christmas music to put you in the Christmas mood. You probably already have a collection of Christmas music at home. If not, you can always listen to Christmas stations on Pandora. Stores around Christmas time are beautiful. I love all the decorations and the general feeling of Christmas. But it can be exhausting to go to the stores. Amazon Prime is a friend of the chronically ill. The two-day free shipping is so convenient. And for a small fee you can have Amazon to wrap the presents too.Try Amazon Prime 30-Day Free Trial! If you have the energy and ability to go to stores, do so even if just for a moment. Go during the morning hours when it is not crowded and it will be way less stressful. Bring a friend along. Someone who knows and understands your situation. Go for a a ride or walk to enjoy the lights around the neighborhood or downtown. Do you know others who suffer from a chronic illness or are going through some hard times? Make their day special by cheering them up. 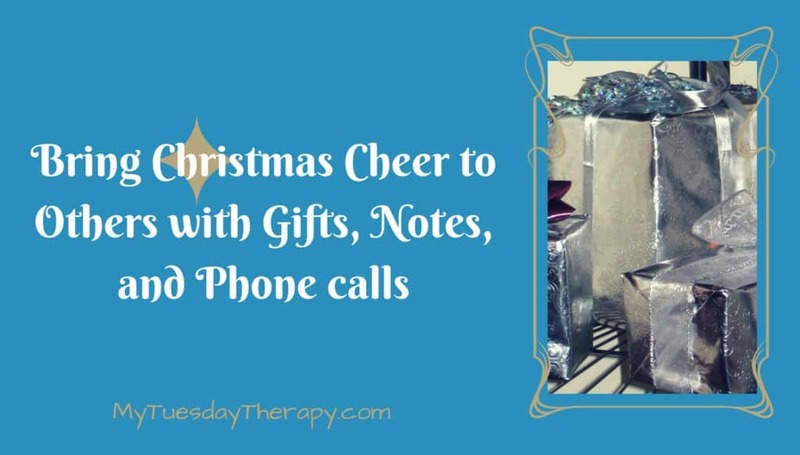 Have a list of names at hand so when you have a moment call, text or write a little note to wish your friend a Wonderful Christmas. Your list might be a long one so don’t fret if you can’t get through the whole list but bring Christmas Cheer to as many as you can. What a great way to celebrate Christmas! Many churches have monitors in the lobby or other rooms so you don’t have to go in to a crowded place. And you can easily slip out if need to. If you can’t go, perhaps you can have your own candle light service at home. Plan a party together. Your children would love to perform the songs they know. Maybe they could also put together a play for you and your spouse. Make some simple treats and play fun games. 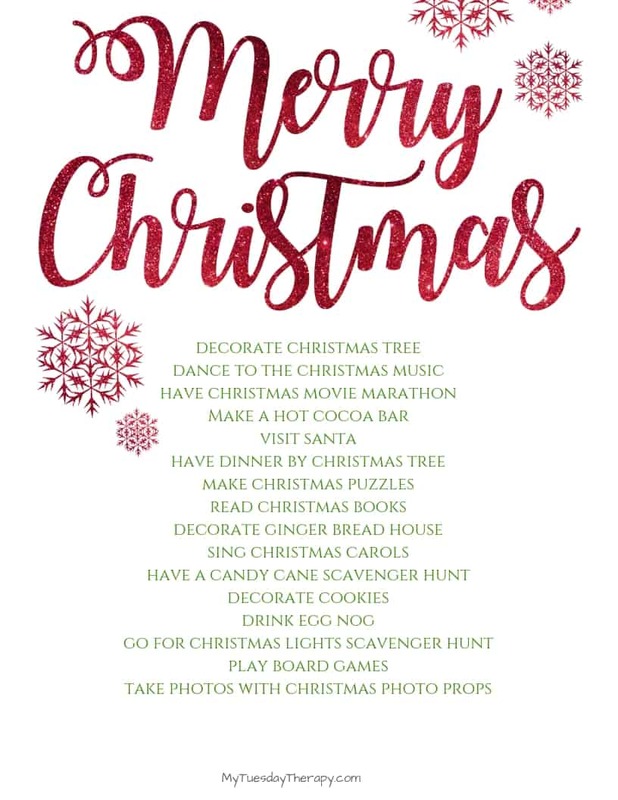 A printable Easy Christmas Bucket List can be found in the Freebies for My Tuesday Therapy subscribers. Sign up below. 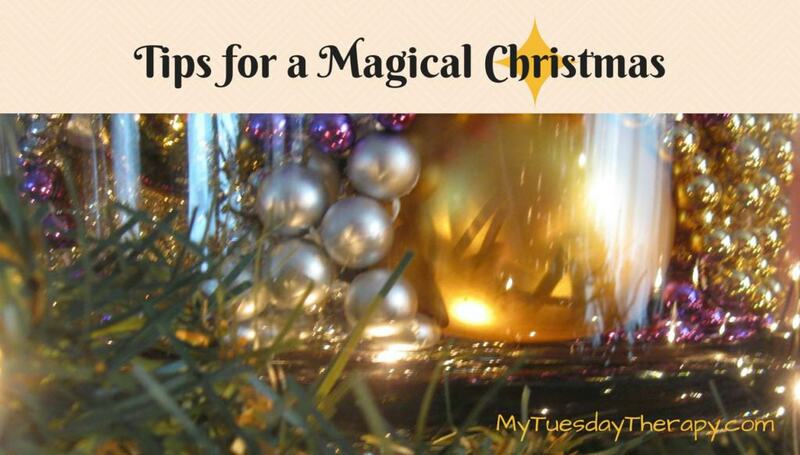 I hope these tips will help you to have a Wonderful Christmas this year!